Sadly, Jonathan—known to his family as Yoni—would never have the chance to realize his exceptional potential. In 1976, at the age of 30, he died heroically while leading the famous rescue of 105 hijacked Jewish hostages in Entebbe, Uganda. Instead, it fell to his younger brother, Benjamin, to make meaning of his brother’s sacrifice and create a meaningful legacy. Benjamin, of course, would go on to become the two-time prime minister of Israel—serving first from 1996 to 1999; elected to his current term in 2009. Few would argue that he has successfully built much of anything in those two terms. His first go-around was marked by corruption charges and derailment of the Israeli-Palestinian peace process. So far, his second has been defined by an improved Israeli economy but also a marked increase in the building of illegal settlements in the occupied West Bank—land which Israel captured after the 1967 war with its Arab neighbors, but which most of the world, including the United States, regards as Palestinian territory. But with the April death of his revered 102 year-old father, Benzion—who was there at Israel’s founding and served as a long-time critic of the peace process—Bibi might have the chance to create something lasting. While mourning his father’s passing, an unprecedented new center-right governing coalition was born in the Knesset, Israel’s Parliament. Now with nearly 80 percent of the Knesset in his coalition, Bibi finds himself potentially relieved of the weight of his father’s hawkish pessimism while simultaneously offered the opportunity to secure the state—the Zionist dream—his brother died protecting: Jewish, democratic, and safe. No prime minister has ever been in a better position to make peace with the Palestinians and ensure Israel’s future. And yet, the peace process has yielded only impasse and mistrust. After failing in their United Nations bid for statehood last September, the Palestinians have come no closer to their goal. 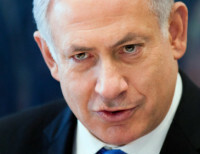 Bibi has refused to negotiate with the preconditions that the Palestinians demand. Though the broad outlines of a two-state solution have been tacitly understood since the 1993 Oslo Accords, neither side has been able to establish trust and take the final plunge. At this point, the most viable solution may be, as the former head of Israel’s Navy and internal security, Ami Ayalon, says, “Instead of building trust and then agreements, we make the agreements now.” Ayalon and the organization he co-founded, Blue White Future, have proposed an approach hewing to the generally accepted two-state framework that Israel could pursue unilaterally and step by step, without waiting to hammer out the details at the negotiating table. The proposal—declaring that Israel will return to negotiations anytime; renouncing claims of sovereignty and ending settlement construction east of the security barrier; and creating a plan to help 100,000 settlers relocate within Israel’s recognized borders—could be undertaken without compromising Israel’s security. It would signal Israel’s true willingness to accept a Palestinian state alongside its own by simply starting to make it a reality. Over 300,000 Israelis and 200,000 Palestinians have signed a petition supporting the plan and, along with reasonable security guarantees, 80 percent of the Israeli public approves of such an approach. And on Wednesday, even Israeli Defense Minister Ehud Barak appeared to endorse unilateral action. Ayalon terms this approach “constructive unilateralism,” but the process might better be called “mutual unilateralism,” since Bibi would have a partner working in parallel, in the person of Palestinian Prime Minister Salam Fayyad. Since becoming prime minister in 2006, Fayyad has doggedly worked to build a Palestinian state, with some impressive successes (until Bibi took power and began undermining him by building more settlements). For Bibi to act would take a tremendous leap of faith, to be sure. Many are the leaders of Israel who have vowed not to be the ones responsible for conceding hard-won gains. But none of these will be remembered as true leaders. And as a student of history, Benjamin Netanyahu must know that to escape the trap of the past, a new way must be tried. The question now is whether Netanyahu can be as courageous in securing the future of Israel as his father was in imagining it and his brother was in defending it. It was the fate of Jonathan Netanyahu, in his heroic and all-too-brief time among the living, to battle but not to build. His younger brother, informed but not inhibited by these remembrances, now has the opportunity to step out of the shadows of the past, inscribe his name forever as one of Israel’s most courageous sons, and create. It is the only thing that will ultimately make Yoni Netanyahu’s sacrifice matter. This entry was posted in Articles, Israel, Op-Eds and tagged Ami Ayalon, Bibi, Ehud Barak, Israel, Jonathan Netanyahu, Paris, Yoni Netanyahu by Stanley A. Weiss. Bookmark the permalink.